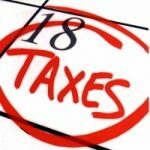 Now that Tax Day has arrived, it’s time for Congress to get serious about reform. The American Council for Capital Formation (ACCF) announced today that Steve Moore, Senior Economic Advisor to the Trump Presidential Campaign has joined the ACCF Board of Advisors. Moore is the Distinguished Visiting Fellow for Project for Economic Growth at The Heritage Foundation. He is also a former member of the Wall Street Journal editorial board and a long-time expert on tax and economic policy in Washington. The varying rates of tax cuts for corporations and pass-throughs in the Ryan plan have become a rallying cry for smaller firms. “You can’t have a tax reform that favors one type of business,” says Pinar Cebi Wilber, a senior economist at the American Council for Capital Formation, a pro-business group. "We should have an overall business tax reform." While the regulatory approach to reducing greenhouse gas (GHG) emissions in the United States has largely focused on the power and transportation sectors, it’s clear that substantial reductions by the industrial sector would be needed to meet President Obama’s pledge under the Paris Agreement. This report by the ACCF Center for Policy Research and the U.S. Chamber of Commerce Institute for 21st Century Energy summarizes a study conducted by NERA Economic Consulting on the potential impacts to the U.S. economy of regulating industrial sector GHG emissions. 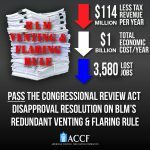 The American Council for Capital Formation (ACCF) has launched a social media, digital, and print ad campaign urging the U.S. Senate to pass the Congressional Review Act (CRA) Disapproval Resolution repealing the Bureau of Land Management’s (BLM) duplicative and costly venting and flaring rule. The campaign is focused on Washington, D.C., West Virginia, Ohio, Tennessee, Colorado, Indiana, and North Dakota. The American Council for Capital Formation held its first economic policy salon of the Trump era on March 1, 2017. The Federal Energy Regulatory Commission (FERC), the independent regulatory agency responsible for regulating interstate pipelines, hydropower, transmission lines, and the sale of electricity is facing a number of challenges, including the power sector's rapid shift from coal to natural gas and, increasingly, to renewable energy sources. The American Council for Capital Formation Center for Policy Research recently hosted a conversation with former FERC commissioners Philip Moeller and James Hoecker on these and other public policy issues facing the Commission. The event was moderated by Glen Boshart of SNL Global. ACCF is proud to announce a new feature from syndicated cartoonist Ken Catalino. Starting this week, the Capital Corner Cartoon will add a little color and - we hope - a little pointed humor to our coverage of current events. On February 14, the American Council for Capital Formation hosted a forum on tax reform with U.S. House Ways and Means Committee Chairman Kevin Brady (R-TX). Chairman Brady shared his perspective on the upcoming debate over tax reform before a capacity crowd of Washington business and trade association leaders, nonprofit groups and the media.